At Groupe AZ Extermination, our specialists intervene quickly while informing you over the course of each step in the elimination of pests and vermin. Appearance: Adult bed bugs are reddish-brown in color, with an oval and flattened body. They do not have wings and have microscopic hairs that give them a striped appearance. Adult bed bugs are 5 to 8 mm long and do not move fast enough to escape the sight of a careful observer. The nymphs are translucent and lighter in color. Grow into adults, they become increasingly dark and opaque. As adults, they are often compared to lenses or apple seeds. Habits and Biology: Adult females lay two to five eggs per day, between 300 and 500 eggs during their lifetime. There are three main stages of development with bed bugs: Eggs: white, of a millimeter long, they will hatch after 10 to 14 days. They are deposited in clusters and fixed around (cracks, crevices, inside the walls, etc.). Nymph resembles the adult insect, but smaller. The nymph feeds on blood as adults, but is more prone to fasting. It goes from pupa to adult status after about a month. Adult: its lifetime is about 5 months, it feeds regularly. Without food, the adult can survive a year dormant. Nourishment: Bed bugs feed on human blood at night only. They feed every 3 to 7 days. They are attracted by vibration, heat, odors and carbon dioxide (CO2) released by the individual. 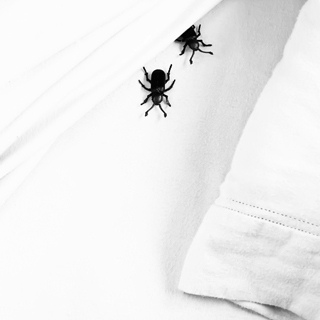 Often at the beginning of an infestation, bed bugs do not go poking one person in the dwelling. Reproduction : The bed of the tack of said reproduction mode is traumatic, since the male does not use natural reproduction paths of the female during coupling. Although equipped with natural reproduction paths, they will only be used during egg laying. The male reproductive system with a spike in (that is to say as a sharp needle) perforates the female abdomen so as to access the spermalège. He then injects his sperm in this organ paragenital. Other: Infestations homes and hotels are increasing rapidly in recent years. After World War II, better domestic hygiene and the massive use of insecticides had eradicated most of bedbugs But in the 1970s, many products have proved harmful to health (including DDT), hence limited use. Bedbugs have also benefited from the increasing number of international travelers, baggage bringing these illegal on the European and American soil. The lack of communication between the various parties during an infestation aggravates the problem. Some tenants do not disclose the history of infestation bedbugs to newcomers, and some tenants do not speak in the adjacent tenants of shame or fear of financial reprisals. Insecticides are effective, but may, if excessive, do more harm than good. It is virtually impossible to solve the problem without the need for a specialist in pest management. Do not wait to be infested! For the extermination of bed bugs, call Groupe AZ Extermination. His professional inspection is free, effective and very fast.